Japanese Garden Design is increasingly popular in Australia. 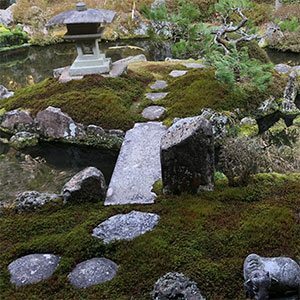 Two main types of gardens are included, the Rock Gardens or ‘Zen Gardens’ which are associated with temples and Buddhism, as well as the traditional Japanese gardens. 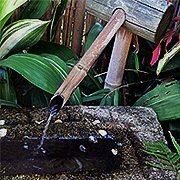 Although only part of the overall solution Japanese Stone Lanterns and Water Bowls can help give an instant effect. (see picture right for a very simple Japanese Garden effect). Spaciousness – An open area, this could be a lawn, or a pond. Artificiality – Trained and pruned trees, artificial rock outcrops, hills, mounds and similar. Antiquity – The use of old statues and objects including old stone pathways. Panoramas – Views, either to areas outside the garden or positions within the garden, such as a hilled or raised area where much of the garden can be viewed. The design elements of water, stone, raked sand and plants combined to create a unique and peaceful setting. Japanese Courtyard Design with water features, tea gardens and Zen gardens are particularly popular. Japanese gardens can appear to be a minimalist approach to design, however it is the placement of all of the elements, in relationship to each other and their orientation to buildings and the broader landscape that provide the overall experience. So what may seem to be a simple design can actually be a landscaping challenge, trees trained to grow to scale rather than full heigh are an example. Dwarf japanese maples are often used for this purpose. And of course we have those small garden spaces which require careful planing if they are to fit in with the broader theory of Japanese garden design. With an increasing number of questions regarding Japanese Garden styles we have attempted to summarise what we see as the 5 major styles of Japanese Garden. “Chisen” meaning a water garden made with a pond or a spring, usually with a low mound to represent a hill in the background. Flat Garden The flat garden uses white sand, moss, grass, and evergreens. The garden is designed to create a series of rounded shapes, these shape symbolize happiness or enlightenment. The Tea Garden includes a ceremonial tea house. 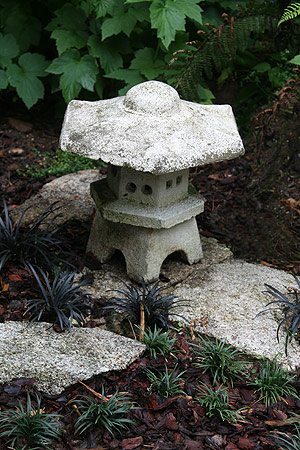 Stone lanterns, stepping stones, and a stone water basin are intrinsic elements. Waterfalls and a pond are the important elements. A shelter ‘Azumaya’ is a important, it provides a place where one can sit and view the garden. This is a walled garden often used for prayer by Buddhist Monks. Sand and rocks are the key elements, they are symbolically arranged. 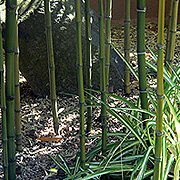 If you are a purist you could follow a particular style, however for most people the elements of a Japanese Garden are enough to create the feeling that is required. This fascinating (and famous) Japanese Temple includes a Buddhist Zen ‘dry garden’. This Japanese garden is formed entirely of rock and sand. 15 Islands of rock, surrounded by moss are in turn surrounded by raked sand. The style is called karesansui or ” dry landscape” and this particular garden dates back to the 15th Century. The 15 rocks are laid out so that from any point only 14 may be seen at once. The sand around the rocks is raked in a circular pattern, elsewhere it is raked in straight lines. Ju Raku En is the Japanese garden located at the University of Southern Queensland’s Toowoomba campus, it includes a dry garden, Japanese stream and a wonderful azalea planting. Cowra’s Japanese Garden is perhaps the largest Japanese style garden in Australia, a wonderful representation of a number of styles. The Gosford, Edogawa Garden is a ‘strolling garden’. Edogawa is Gosford’s sister city in Japan. Dry stone garden, Koi Ponds in a ‘Shuyu’ style. 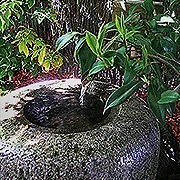 Rockhampton Botanic Gardens have a Japanese Garden section. Campbelltown in Sydney has Japanese Gardens that are gift from the sister city, Koshigaya.